Wild: Pachycephalosaurus is a bit of a conundrum. It is a very passive (even friendly) herbivore, common to much of the island. At the same time, it is one of the most dangerous herbivores that I have yet encountered on the island. Its charging headbutt is a display of sheer physical power, and can kill much more quickly than you might think. Domesticated: Pachycephalosaurus is an excellent battle-mount for those who want to ride a smaller, nimble combatant into the fray. Because of its particular musculature, it cannot effectively carry large quantities of resources. It can, however, move with brief magnificent bursts of speed, and its headbutt is simply devastating. 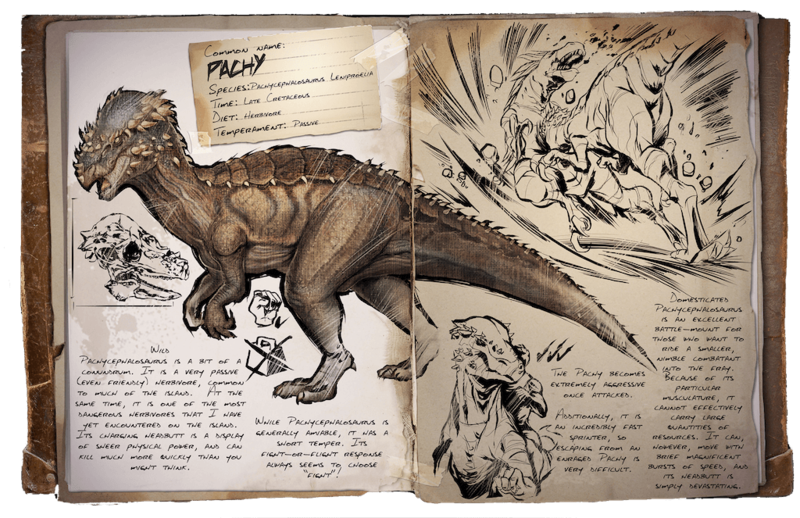 Known Information: While Pachycephalosaurus is generally amiable, it has a short temper. Its fight-or-flight response always seems to choose “fight”! The Pachy becomes extremely aggressive once attacked. Additionally, it is an incredibly fast sprinter, so escaping from an enraged Pachy is very difficult.